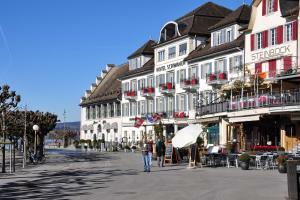 Hotel Schwanen price per day from CHF 490 Situated at the picturesque lakeside promenade of Rapperswil, Hotel Schwanen is housed in a historic building from 1233, boasting panoramic views of Lake Zurich and of the medieval Old Town. For an ideal start in the day, a coffee machine is provided in the room. A bar and a bistro with seasonal dishes are offered as well. Ferienwohnung Bally Set in a quiet location on the northern part of Brunnen, Ferienwohnung Bally is 2 The apartments come with a balcony offering panoramic views of the village and the Mythen Mountain. There is a dining area and a fully equipped kitchen with a dishwasher. From Brunnen you can take a boat trip on the Lake Lucerne or join the 35 km long hiking path of the Weg der Schweiz..
Apart Holidays price per day from CHF 145 . Ferienwohnung Suter price per day from CHF 100 Set amidst the pristine mountain landscape of Seewen, Ferienwohnung Suter offers unspoilt views of the Rigi Mountain and Lake Lucerne. Baby-sitter service is available on request and packed lunches can be ordered directly by the owners. Sattel-Hackstuckli Ski Area can be reached within 15 km..
Swiss Holiday Park - Apartments price per day from CHF 261 . Gasthof Löwen price per day from CHF 130 . Bed & Breakfast Arth am See . Motel Mühle price per day from € 86 Just a 5-minute drive from Lake Zurich, Motel Mühle enjoys a quiet location on the outskirts of Wollerau. A public sports centre with a football field and tennis courts is nearby. They feature parquet floors, a flat-screen cable TV, and a bathroom with a hairdryer..
Seehotel Riviera price per day from € 83 The family-run Seehotel Riviera is situated in the small bay of Gersau at Lake Lucerne, surrounded by a marvellous mountain scenery. Each room has its balcony, offering superb lake views. Schwyz: recommended ski resort for experts.